Heat oven to 350°F. Spray 13x9-inch pan with cooking spray. In large bowl, beat cake mix, buttermilk, oil, eggs, cocoa and food color with electric mixer on medium speed 2 minutes. Pour into pan. Bake 25 to 30 minutes or until toothpick inserted in center comes out clean. Cool completely. Line cookie sheet with waxed paper. Crumble cake into large bowl. Add frosting; mix well. Shape into 1 1/4-inch balls. Place on cookie sheet. Freeze 15 minutes. Transfer to refrigerator. Dip half of balls in melted green candy and other half in melted red candy; tap off excess. Return to cookie sheet; let stand until set. Spoon melted white candy into resealable food-storage plastic bag; cut off tiny corner of bag. Pipe designs on cake balls; let stand until set. 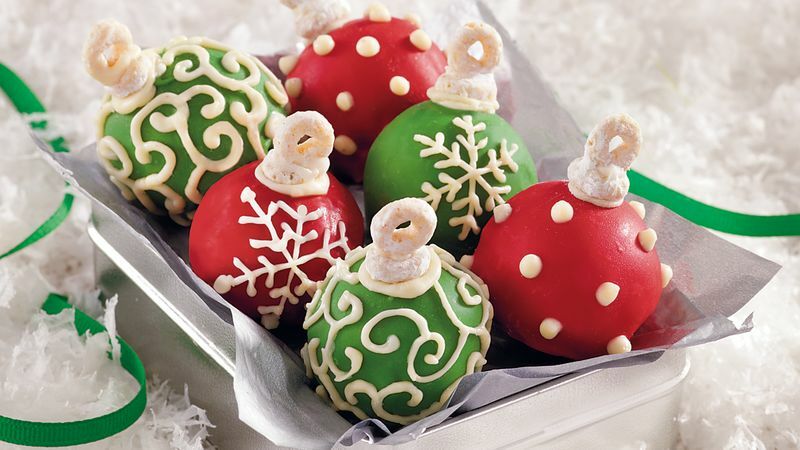 Gently press 1 cereal piece on top of each cake ball, attaching with white candy. Pipe dot of candy on cereal piece; attach another cereal piece upright in center for ornament hook.